The International Monetary Fund (IMF) has spoken positively about steps being taken by the St Kitts and Nevis government to address a debt problem that led to the country defaulting on a domestic bond that became due on November 25. An IMF mission to the twin island federation November 28 – December 12, to undertake the first review of the program under the Stand-By Arrangement (SBA) approved by the Fund’s Executive Board on July 29, 2011, found “significant progress has been made on the structural reform agenda”, to tackle the debt that is 199 per cent of GDP. The restructuring includes measures to strengthen revenue collection and Treasury management to improve budget performance, enhance financial regulation and supervision, and supports the debt restructuring. “The legislation to facilitate the corporatization of the electricity department has been passed resulting in the establishment of the St. Kitts Electricity Corporation, which is expected to cover its costs,” said Alfred Schipke, head of the IMF staff mission in the post trip statement. The statement said the registration and valuation of the first 600 acres of land, which are part of proposed debt-land swap, is expected to be completed before the end of this year. The land swap is potentially politically sensitive in a country where only 19.4 per cent of the 261 sq km/63,000 acres (St Kitts 168 sq km/41,000 acres, Nevis 93 sq km/22,000) of land is arable. 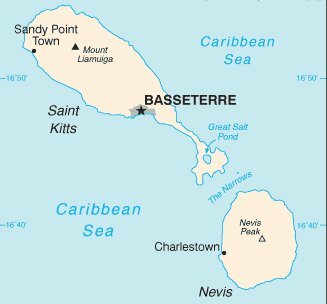 “An IMF team visited Basseterre during November 28–December 12 to undertake the first review of the program under the Stand-By Arrangement (SBA) approved by the Fund’s Executive Board on July 29, 2011. The mission held meetings with Prime Minister and Minister of Finance Hon. Denzil Douglas, Premier Joseph Parry of Nevis, Members of the Federal Cabinet and the Cabinet of the Nevis Island Administration, Governor Dwight Venner of the Eastern Caribbean Central Bank (ECCB), and senior officials of the Ministries of Finance, Sustainable Development, and the ECCB. The mission would like to thank the authorities and technical staff for their warm welcome and excellent cooperation. “The mission reviewed the ongoing macroeconomic and structural policies and also assessed the performance of the program’s quantitative targets at end-September 2011. All quantitative performance targets appear to have been met, despite continued weakness in real output growth. The revenue enhancement measures implemented last year continue to yield increased tax receipts in line with program expectations at the time of the SBA approval. The authorities have also restrained expenditure growth in order to meet the program target for the overall fiscal balance. “Significant progress has been made on the structural reform agenda that aims to strengthen revenue collection and Treasury management to improve budget performance, enhances financial regulation and supervision, and supports the debt restructuring. The legislation to facilitate the corporatization of the electricity department has been passed resulting in the establishment of the St. Kitts Electricity Corporation, which is expected to cover its costs. At the same time, progress has been made in discussions with both external and domestic creditors over the terms on which the public debt, which remains unsustainable, will be restructured. Possible scenarios for the restructuring of the external debt have been discussed with creditors and discussions on a framework for the dealing with domestic creditors are advancing. As the government has previously indicated, Treasury Bills will be excluded from the debt restructuring exercise. Meanwhile, the registration and valuation of the first 600 acres of land, which are part of proposed debt-land swap, is expected to be completed before the end of this year. “The mission and the authorities have agreed on a draft letter of intent that incorporates the policies to be presented in the 2012 Budget to continue the Government’s home grown fiscal consolidation program, and reconfirms the structural benchmarks for 2012. These include, among others, the drafting and enactment of new procurement legislation, development of a medium term expenditure framework, and strengthening of social safety nets. Based on these actions and on the fiscal performance, the mission would recommend to the IMF Executive Board completion of the first review under the SBA. The IMF Board is expected to discuss the first review at the end of January 2012.